Western media often spread myths about the extent of Internet censorship in Belarus. Many have the impression that all or many social media sites have been shut down or blocked by Belarusian KGB. The truth is that unlike television or FM radio, Internet access remains largely unrestricted in Belarus. Because only a small fraction of Belarusians use Internet to get political information, authorities are rather relaxed about Internet censorship. They usually intervene to temporarily block certain Internet web sites around the dates of scheduled protests. In addition, they effectively use traditional methods against pro-democracy activists such as arrests and pressure on protestors' universities and employers. Vkontakte is the most popular social network in Belarus which Belarus authorities actively target. The network headquartered in Russia looks very similar to Facebook. Vkontakte is hosting the "Movement for the Future – Revolution Through Social Network" group, where citizen actions are announced, commented and reported on. Instead of blocking the whole network, Belarusian authorities deploy more creative approaches. For instance, around 22 June a fake page appeared for Belarusian users, informing them that the group page was infected by a virus, and trying to collect information about their accounts from them. On 4 July, the group’s main page was closed for all visitors globally by the administration of Vkontakte, supposedly for violations of the rules by the group. The group’s page was then reopened with 10 times less members than it used to have (was around 200,000 and is now around 20,000). Around 13 July, access to the whole Vkontakte site was blocked inside Belarus for several hours before and during the action of that day. Security services also visit pro-democracy activists who can be easily identified on social networks. 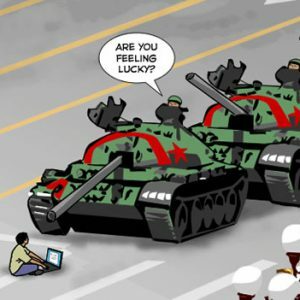 In addition, the authorities increasingly harass bloggers. The most notable criminal cases for defamation were initiated against Andrei Poczobut and Evgeny Lipkovich. Security service agents also conduct "preemptive talks" with pro-democracy activists and detain the most active for short periods of time. Authorities can put pressure on virtually every employer or university in Belarus. The economy is still in state hands in Belarus and most people work on the basis of short-term employment contracts. With rising unemployment the prospect of losing a job is enough to deter many from active protests. Finally, around the dates of protests opposition and independent web sites are routinely subjected to denial of service attacks. That involves saturating the target web site with an overwhelming number of external requests. The web site then cannot respond to legitimate traffic, or responds so slowly as to be rendered effectively unavailable. Charter97, Nasha Niva and Euroradio web sites are the main targets of attackers. The Western media often overestimate penetration of Internet and social networks in Belarus. Although the role of Internet in Belarus is steadily increasing, it is far from being the dominant source of information. According to a May survey of the Independent Institute for Sociological and Political Studies, 33% of the adult population in Belarus received information from the Internet and only 2.2% – from social networks. This 33% include hard line supporters of the authorities and those who never read any political news on Internet. Only around 2% of the Belarusians use Facebook. Twitter is even less popular. According to various estimates, there are less then 50 thousand Twitter users in all regions of Belarus. However, the authorities take no chances and actively use trolling and jamming on the days of street actions. Security services use nicknames very similar to those of pro-democracy activists and independent media to spread false news and negative comments. That makes it very difficult for pro-democracy activists to rely on Twitter. Because of the small numbers and chaotic character of social networks protests security services can crack down on them with relative ease. Most analysts agree that only when "ordinary" Belarusians begin to protest the situation may pose a serious threat to authorities. The vast majority of Belarusians relies almost exclusively on television and FM radio to receive information. These media are strictly controlled in Belarus and wide-scale crossborder broadcasts from neighbouring Poland and Lithuania remain possible only in theory. Last week Russian President Medvedev removed the remaining obstacles for Belarusians who want to work in Russia. Now Belarusian citizens have virtually the same rights as Russia's own nationals. By equalising the rights of Belarusian nationals with its own nationals Russia plans to take away something more valuable than Belarusian plants and factories – its people. The difference in the level of commitment of the European Union and Russia is striking. Russian government removes all restrictions on movement and employment of Belarusian nationals. European governments fail to agree on simplification of visa procedures for Belarusians. Russia launches anti-Lukashenka PR campaigns in Belarus using its TV channels to convey the benefits of integration with Russia. Europe does little to promote its values considering them self-evident. Russia provided billions in subsidies to the Belarusian economy while Europe usually comes up with a new set of conditions, which cost nothing. It is time to admit that the Europe's approach to Belarus failed and adopt a new strategy. Some hope for a quick fix in the form of revolution in Belarus and that everything else will follow. This approach is misleading. It is impossible to predict a revolution and many raise doubts that it will happen any time soon. Although the recent events in the Arab world showed that even very solidly looking regimes could collapse within weeks, the wait and see approach should not be the main strategy. Moreover, those who believe in a quick political change have no plan to deal with possible unrest and chaos in the country. Even assuming a peaceful change of regime, Belarus will face an enormous challenge to become a liberal democracy based on a market economy. It will take decades to change people's mentality after decades of propaganda. This is why rather than focusing solely on weakening the regime, the international community should do more to strengthen Belarusians' links with Europe. Regardless of how the events unfold, Belarus transition is a marathon, not sprint. Whether the country will see political changes soon or late, Europe should be more involved by opening its borders and integrating Belarusian scholars, students, and common people into its orbit. If political changes happen soon – that would smoothen the transition. If it takes longer – more involvement will make the democratic model more attractive and ease the transition. Conferences, political dialogue and formulating new conditions cost nothing. Investments, particularly into civil society, education and media, and deploying people on the ground do cost money. Europe's investment in Belarusian civil society is negligible compared to money it invests in the Middle East or Asia. Take another example. Belarusians have to pay several times more than "home" students if they want to study in the European Union. That makes Russian universities where they can study for free their natural choice. The EU should open its universities for Belarusian students giving them the status of "home" students. This will not hurt universities, but would be a boost to bringing up the new generation of Belarusians. Some people will stay abroad after their studies, but many will return to Belarus. Belarus rarely appears in Europe's media and Europe does little to promote its values and vision in Belarus. An average Belarusian has a number of Russian TV channels at home which broadcast Russia's vision of Belarus. Europe's capabilities are nowhere near, despite the fact that Belarus borders three EU countries which could launch cross-border TV broadcasts to Belarus. Again, the lack of commitment is evident. The European Union remains a big bureaucracy where many countries have to come up with a consensus. Schengen zone countries still struggle to agree an easier visa regime for Belarus, which is a sad reminder how inefficient European decision-making could be. When it was difficult to reach an EU-wide consensus in the past, countries such as Poland and Sweden formed coalitions of the willing to go beyond words. Some countries have already eased their visa regime with Belarus setting a good precedent for others. For historical reasons Russia's influence has been strong in Belarus. However, the West is by far richer and stronger than Russia. Instead of hiding behind the remnants of the iron curtain on the Belarusian border, Europe should demonstrate a more assertive approach. It is important to make a clear distinction between Belarus authorities and Belarusians as a European nation. Not only in declarations but also in concrete actions. This will benefit not only Belarus and its neighbours but security and prosperity in Europe as a whole.